EC-Link is our data logger software provided for free to any user of the following instruments: PAT-Stand-16/PAT-Tray, ECD-3, ECD-3-nano, ECD-2-DL, PAT-Cell-Press with PAT-Stand-1 and ECC-Press-DL. With the EC-Link software, the electrical signals of the testing instrument may be recorded into text files and viewed as strip-charts. Connection between the PC host and the data logger is being established via USB. Multiple instruments and associated instances of the EC-Link software can be run in parallel on the same PC. The EC-Link software is licence-free. Updates are regularly available at no charge. You can install the EC-Link software on any computer running one of these operating systems: Windows 10, Windows 8, Windows 7, Windows Vista, Windows XP (SP2 or later). 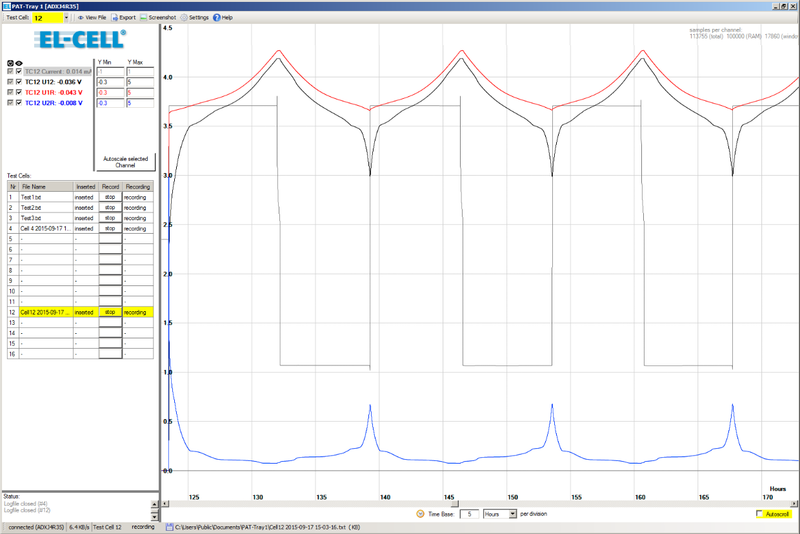 Screenshot showing voltages and current recorded with the EC-Link software during cc-cv cycling.